I was camping over the weekend so did not have Internet access. Now that I'm back it's time to really focus on what I can do during the coming six months to draw attention to volunteer-based tutor/mentor programs in Chicago and other cities and to the information I share on the web sites I host. This information can be used by existing programs, volunteers, youth, donors, etc. to help thousands of young people in many neighborhoods connect with networks of extra adults in well-organized non-school programs. School starts in less than a month, so anyone who writes a story about their experience in a tutor/mentor program, or about the need for such programs in more places, can help attract volunteers and donors to these programs if they just add links to portals that enable people to search for programs by zip code and type of program. 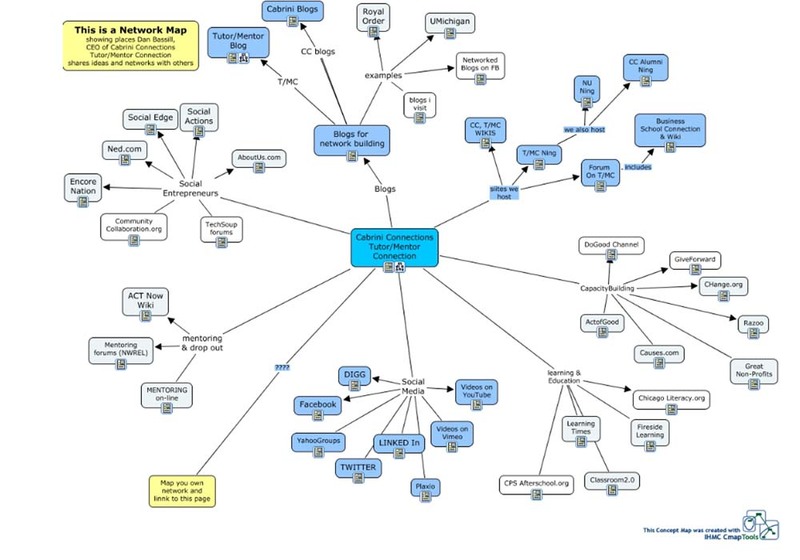 In this concept map I point to the Chicago Tutor/Mentor Program Locator and Chicago Links Library as well as to other volunteer search engines that anyone can use. While school starts soon the next event I'm organizing comes on November 19 when I host the next Tutor/Mentor Leadership and Networking Conference at the Metcalfe Federal Building , 77 W. Jackson, Blvd, in Chicago. During the June 2012 conference we recorded three panel discussions. Below you can find a video from the first of these. During the November 19 Conference there will be more panels like this. In order to host these conference and keep fees low to all participants we need volunteers to step forward to offer workshops or be part of panels. This is a list of suggested workshop topics. Speakers can come from businesses and universities or from non profits. If you're interested in hosting a workshop use this form to present your idea. I also need one or two sponsors to help cover the costs. While we hope we can bring together 100 to 150 people at the November conference I hope we can attract even larger numbers to our web sites or to internet meeting places such as the Tutor/Mentor Forum, Facebook, or Linked in. Furthermore, I hope others will use their own media to write articles and encourage volunteers, businesses and philanthropists to support volunteer-based tutor/mentor programs in different locations throughout Chicago and other big cities. By showing how important tutor/mentor programs are to inner-city youth and how such programs depend on donor generosity to operate, the November conference can stimulate year end charity giving if enough people will make an effort to write about tutoring/mentoring in their own media. That's what I'm focusing on now that I'm back from my camping trip. I hope you can help me find others who are focusing on the same topics. The abstract says "Knowledge sharing and creation are considered key processes leading to innovation and organizational performance. Several organizational initiatives have focused on building communities of practice in order to create a platform where employees can share experiences and insights." The article goes on to show the value of people who help organize these communities of practice and who use the Internet to connect people from different locations and different parts of the organization. It also talks about how companies are becoming intentional in how they support the growth of such networks. I've suggested for many years that companies that strategically encourage and support on-going employee involvement in tutor/mentor programs should do this as part of their own workforce and talent development strategies. As volunteers connect in tutor/mentor programs they begin to build bonds with youth and the organizations. They begin to have questions of "what to do" and "what more can I do to help the child, or help the organization." Many programs provide social activities and are beginning to use social media to connect their volunteers to each other and to coach the ongoing invovlvement of volunteers and young people. I believe there is an opportunity for companies and industries to form communities of practice and learning circles consisting of employees from many locations and branches of a company who share ideas with each other based on involvement they have with many different tutor/mentor programs. Such ongoing idea sharing can empower each volunteer with more ideas that they can bring to their weekly tutoring/mentoring and to the way they support the organization where they volunteer. However, it can also lead to new innovations in how the company or industry uses its own resources to support multiple organizations providing the same type of service in different locations. While this would have a growing impact on the availability and quality of volunteer-based tutor/mentor programs it also would create informal social networks connecting people from different parts of a company which would lead to many of the benefits described in the paper I've pointed to. In addition, employees who take on the role of network facilitator supporting employee involvement in social causes will build skills that they can bring to building and sustaining communities of practice focused on internal corporate goals. Gaining such skills from volunteer involvement has limited cost but potentially great benefit to the company. So how do we encourage this type of growth? Companies who already support this type of community of practice should connect their internal communities to external communities who focus on the same issues. Companies can create face-to-face connection opportunities by encouraging employee involvement in the May and November Tutor/Mentor Conferences we host in Chicago and that others host in other cities. 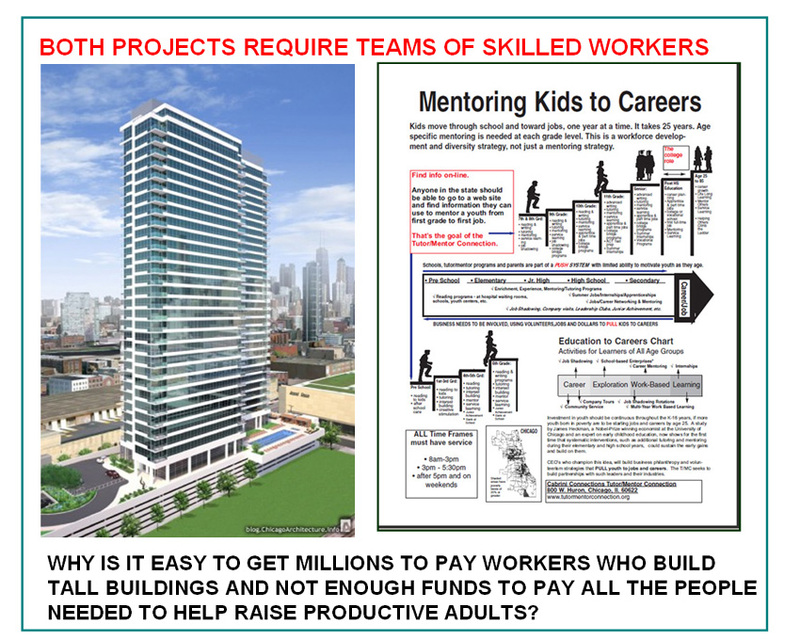 This Role of Leaders PDF shows ways CEOs can encourage employee involvement in volunteer-based tutor/mentor programs in cities where they do business. I'd be happy to work with companies, hospitals and professional associations to help you build communities of practice focused on helping volunteer-based tutor/mentor programs grow in more places. We can connect in forums like http://tutormentorconnection.ning.com or on Facebook or LinkedIn or in forums already hosted by company teams. Let's connect. One year ago this week I left my President, CEO role at Cabrini Connections, Tutor/Mentor Connection and embarked on a new journey as the Tutor/Mentor Institute, LLC. If you're interested in seeing why the change took place read these blog articles. The big challenge has been finding talent and revenue. Most individuals who supported me as a non profit between 1993 and 2011 find it difficult to continue to support the same work under an LLC (for profit) structure. Most foundations only support non profits or social enterprises with a business plan that promises a financial return on investments made. Finding volunteers who can and will manage the technology or help with building a business plan has been difficult, but I have had some help in this area. a) I did not have a volunteer team in place, with civic reach and a commitment to the vision of the Tutor/Mentor Connection in July 2011. Without that a non profit has no chance of finding the investment capital needed to thrive. b) I'm 65. Thus, in building a new non profit I need to find volunteers who want to "own the vision" and carry it forward for another 20 years after I'm no longer involved. I keep looking for such people. It's a difficult commitment to make. 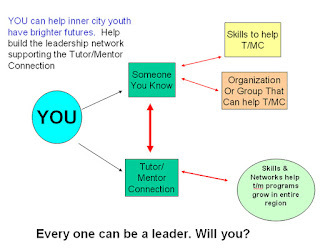 c) Thus I created Tutor/Mentor Institute, LLC to offer structure, a new way to generate revenue, and a new way to create potential partnerships with people and organizations in many cities who have the same problems of high poverty as Chicago. I've operated for the past year on less than $11,700 in revenue. I've kept expenses to under $24,000. I've paid the difference from my own savings and have not drawn a salary. This is Chicago. It's the 3rd largest city in the United States. If you search for "tutor mentor" on Google or other search engines my sites come up on the first page. In this "nitch" market, I'm the top resource. Who are the advertisers or sponsors that would want to partner with me? I've posted several articles over the past year showing that social enterprises do the same work as non profits, but with a different tax structure. Today I'd like to share the thinking of Susan Ellis, President of Energize, Inc. on why she chose not to be a non profit. I could have opted to make Energize a nonprofit organization, recruit a volunteer board of directors, raise funds, and put myself on salary. Instead, I had a conscious, philosophical reason for taking the for-profit route. I have watched too many nonprofits convince third-party funders of the value of their services, while those who actually receive the services are dubious of their worth. Since funders rarely ask the end users what they think, grants continue to be awarded mainly on the skills of the organization's proposal writers. The only way that I could be certain that my clients valued Energize's services was to establish a direct, customer relationship with them. Many of our customers pay for our training, books, and other help with money they, in turn, get from donors. But the customer decides how to spend that money. If they choose Energize, I feel that is a true endorsement. And that's why I'm proud to have lasted in business for over 30 years." I've been trying to figure out a business model to generate revenue for to keep the Tutor/Mentor Connection a free service for parents, volunteers, youth, community leaders, etc. At the same time I've spent time every day for the past year maintaining the web sites, building the network, and doing the work that needs to be done. Creating a business model to support the strategies that I've developed over 18 years is far more difficult that one that supports a new start-up without an existing set of projects that need nurturing every day. I created this wiki to show the range of work I think needs to be included in efforts that reach kids in all high poverty neighborhoods with long-term, mentor rich learning activities. I can't drop 90% of the Tutor/Mentor Connection strategy and vision just to focus on a single element that might generate revenue. That would be like trying to fight a war with troops in only one location who are armed with rifles but without bullets. 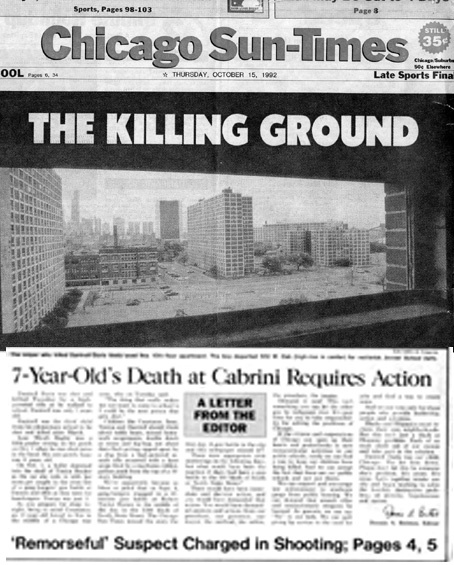 It is a comprehensive plan, as John McCarron indicated when he wrote this article in 1995. One strategy is to find partners or co-owners of individual parts of the strategy shown on the wiki. These could be people in any part of the country or the world. As I look for such opportunities, I will continue to maintain this information and reach out every day to share it in a growing network of people that I meet on line hoping that others will step forward to fill the talent gaps needed to do this work. I hope you'll browse through the blog articles I've written since July 2011 and read the essays I started posting on Scribd.com last October. These have already recorded over 18,000 reads. School starts again in a month and my focus is on helping build greater visibility so that more volunteers and donors support the tutor/mentor programs operating in Chicagoland. That means I also have been trying to reach out to the programs in the Tutor/Mentor Program Locator to check to see if their information is accurate and recruit intermediary groups to help collect information on tutor/mentor programs in different parts of Chicago. In a recent series of articles on the Stanford Social Innovation Review (SSIR) the role of "backbone organizations" is discuss, showing how important they are to bringing the entire community together around key challenges. I think the Tutor/Mentor Connection has been doing work that leads to collective efforts, yet without the support of a major corporate foundation or civic leader and in a much larger metropolitan area. If you agree help me build this platform so it becomes more important to Chicago and can be made available to other cities. On Sunday, June 3, 2012, I participated in an on-line discussion hosted by the Webheads network and met Curt Bonk, a Professor at Indiana University, and author of The World is Open. Curt talked about Instructional Ideas and Technology Tools for Online Success. The archive is here. I reached out to Curt on Linked in and we began to exchange messages. He sent me his book which I've read and found to be a great resource. 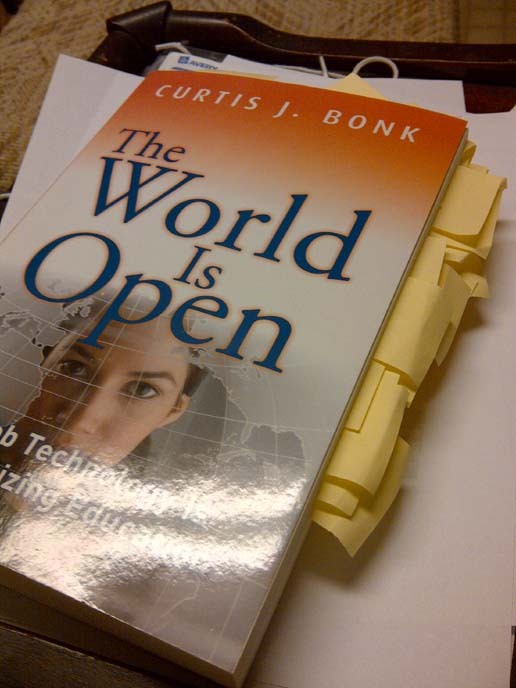 You can see how I used sticky notes to point to pages and links I intended to look up after reading the book. Then I went to this page on his web site and found that he has already done much of this work for me. He has excerpts from each chapter, and has posted links to organizations that he talked about in the book, in a chapter-by-chapter sequence. It's really a great way to connect readers with content. Curt was in Chicago last Friday and we met for breakfast. So in less than month I went from not knowing he existed, to sitting for breakfast and talking about learning, the Cubs and the Milwaukee Brewers (Curt's from Wisconsin!). As I've connected to the Webheads and others I'm dramatically expanding my network and the ideas I have available to do my own work in Chicago. Most recently I've participated in a couple of Sunday morning Google Hangouts. You can find links to these in this archive of Webheads events. These are FREE. Anyone can participate. So what's next? I'd like to create a Google Hangout where I can connect with others who already share my own vision of helping inner-city kids. While I host forums on Ning, Linked in and Facebook, the Google Hangout offers a way for us to connect in live, but informal, conversations and relationship building. We can talk about the November 19 Tutor/Mentor Conference in Chicago, or Volunteer Recruitment efforts taking place during August and September. Or we can talk about ways to connect during January 2013 National Mentoring Month. Or we can just share a bit about what we do in different programs and different places, what works, and what challenges we need to over come. Are you interested? Connect with me on Google+ and lets schedule a time to "hang out". In Chicago there are probably 5,000 adult volunteers serving in organized tutoring and/or mentoring programs as tutors, mentors, and on volunteer board. In the program locator database I show 172 organizations. I'm sure there are additional places where volunteers are connecting with kids, but I don't have that information. In my own leadership of a tutor/mentor program since 1975 I recognized very early that there was no way I could effectively "teach" 100 or more volunteers everything they needed to know to become effective tutors/mentors. Instead I began to amass a library of reading material and used weekly communications and coaching to try to motivate the volunteers to spend time reading, reflecting and learning. In theory that's a great idea. In practice, it's difficult to motivate this type of extra effort on an on-going basis. It's also difficult to track and document how much of this was taking place. So, my question is where are all of these people learning about the challenges faced by the inner-city kids and families they work with? Where do they go to find ideas they can apply each week in their tutoring/mentoring activities? Who coaches this process? Or, where are they learning about the challenges organizers of tutor/mentor programs face in finding the resources (money, space, technology, ideas, talent, etc. )needed to enable volunteers to connect with inner-city kids and to keep them connected week-after-week for multiple years? There are more than 200,000 school age youth living in high poverty areas of Chicago. We need thousand more volunteers in this system. Where are people going for data and ideas that could empower them to help programs grow, and to help the kids in these programs become active learners and CEOs in their own lives? Where do these volunteers go to get this information? I hope that some of you who read this article will circulate it in your own networks. If there are on-line forums where volunteers, board members and donors are converging I really don't know where they are. I do know where there are on-line libraries of information that they could be tapping to learn more about where and why tutor/mentor programs are needed, or what the nonprofit organizers face in trying to make these programs available. You can browse the sections of the Tutor/Mentor Connection library to open your world to a virtual universe of information that is just waiting for readers and learners. Or you can go to Curt Bonk's World is Open web site and see the list of links to on-line learning and education resources that he has amassed. If we're not spending time learning how can we get better at what we do to help kids overcome the challenges of big city poverty? I invite anyone who has ideas on this topic to join in a Facebook or Tutor/Mentor Forum conversation and share what you know. Or, post a link to the online learning you know about so myself and others can connect with you there. 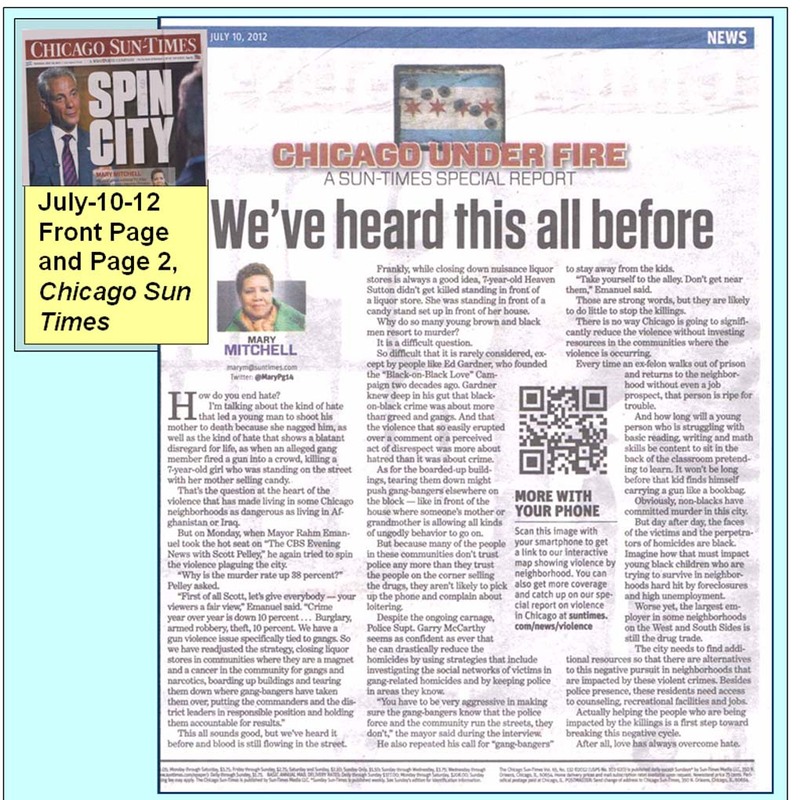 Monday's Chicago Sun-Times devoted the first three pages to Mayor Emanuel's response to the high murder rate in Chicago. On page 2 is a full-page commentary by Mary Mitchell, under the headline "We've heard this all before." Because non-profits don't have money to buy the first three pages of a major newspaper to tell their stories I've followed a "Rest of the Story" strategy to try to get this message consistently in front of readers. If you visit the media and violence links on this blog you can see how I point to stories in the daily media then add maps and commentary pointing out the availability, or lack of, tutor/mentor programs in the areas where the media was focusing that day's story. I also point to articles and research that readers can use to dig deeper. I've primarily followed the two major papers but recognize that many other papers are telling this story. 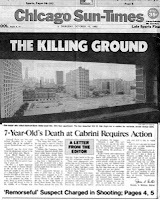 Today my Facebook network pointed me to an article in the Reader, written by Steve Borgia, titled "The root cause of Chicago's glut of murders". In this Steve includes hyperlinks to other articles he's written such as "Separate, Unequal, and Ignored" and "Two mayors, two Chicagos". My goal is that people who are outraged by the stories they see in the local news will form learning circles in their business, company, school and/or faith group and build their own understanding of the program, and their own belief in strategies that connect kids in poverty neighborhoods with ideas and networks of people beyond their own neighborhoods. Volunteer-based tutor/mentor programs can do this if they are structured to encourage long-term connections of kids and volunteers and if they are available in the neighborhoods where their is the highest degree of poverty and segregation. One concern I have is that when I point to articles and commentary in the local media those links do not stay in place far into the future. Thus, as people read past articles on a blog, too many of the hyperlinks are broken...even to my own web site. If anyone has suggestions for ways these articles might be archived for future research and planning, please share your thoughts. I received the message below from Dan Cotter, Chair of the Board for the Lawyers Lend a Hand to Youth Program at the Chicago Bar Association. I've been part of the growth of the Lend A Hand Program since 1994 and love what Dan is doing each year to raise money that can be used to support volunteer-based tutor/mentor programs in the Chicago region. Dan's a lawyer and weight lifter and each year he gathers pledges based on how many pounds he lifts. Through his efforts he has personally contributed more than $200,000 to support tutor/mentor programs in Chicago.We need more heros like Dan, doing the same thing, and helping support-networks grow in every industry, not just in the legal community. Please read this, share it and become a sponsor if you can. With the start of summer comes Lifting to Lend-A-Hand X. 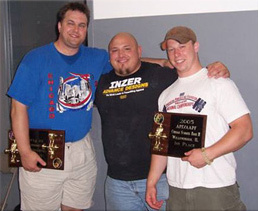 On Saturday, July 28, I will compete in the American Powerlifting Federation- Amateur American Powerlifting Federation Chicago Summer Bash 9. Lifting to Lend-A-Hand is something I created ten years ago to be able to raise funds for Lawyers Lend-A-Hand to Youth, whose mission is to channel the legal community’s resources to promote best practice mentoring and tutoring programs in disadvantaged communities that foster consistent, long-term bonds between adults and youth. I believe strongly in the potential for all youth to succeed. Lifting to Lend-A-Hand X marks multiple milestones. I originally committed to a ten-year campaign, and this is year ten. My goal for those ten years has been $250,000, and we have come close raising a little over $200,000 in cash and in-kind support. Recently, I celebrated my 45th birthday. My personal goal for Lifting to Lend-A-Hand X is to raise $45,000. A big, hairy audacious goal, but one I think I can reach with some help from friends such as you! I and the programs supported by Lawyers Lend-A-hand need your support. Lifting to Lend-A-Hand is like a walkathon event. On the competition day, I will compete in a regular powerlifting meet. The best lift in each of the squat, bench,and dead lift will go toward my total. You can make a flat pledge or you can pledge by the pound. (Obviously, my aging knees and hips would appreciate a flat pledge.) If you pledge $.10 per pound and I lift a total of 1,500 pounds, you would owe $150. My expectations are to be in the 1300-1500 range. You can donate online at http://lawyerslendahand.org/index.php?page=donation. If you prefer to make a pledge, you can send me an email at liftingtolendahand@hotmail.com. Please check to see if your employer matches donations. Each year, your generous individual donations are augmented by employer matches. Every penny raised goes to supporting the program. Imagine if leaders in every industry were constantly raising money and visibility to encourage volunteer involvement and to fund volunteer-based tutor/mentor programs in the Chicago region. More programs throughout the region would have multiple streams of financial support and a more diverse based of volunteers modeling jobs and careers that kids might aspire to. See some of the leadership ideas in the Tutor/Mentor Forum and look for ways you can "be like Dan" starting this fall. These are photos from the June 14 Tutor/Mentor Leadership and Networking Conference held June 14, 2012 at First Unitarian Church in Chicago. The conference consisted of three panel discussions offering programs a chance to introduce themselves to others and to share ideas about strategies that work. The panels offered opportunity for question and answer. Videos will be posted on YouTube and on the conference web site video page. 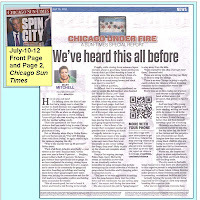 In 2008 I asked interns working with me to visit the Chicago Programs Links section of the Tutor/Mentor Connection library and visit the web site of each program to learn what they were doing and to write a brief review. * Site provides links to research related to tutoring, mentoring, poverty, education, etc. This process of looking at web sites and learning from what they do should be on-going. Every program could learn ideas from each other and use them to improve their own efforts, if they have people doing this comparison and if there were donor/investors ready with talent and dollars that programs can use for constant improvement. However, many of the web sites don't do as well as they need to in telling the program's story. The talent and time needed to collect stories and tell them via web pages, blogs, videos, etc. is not available in every program. Thus, there is a role for volunteers from business, high schools and/or college to reach out and offer to help programs better tell their stories. This goes along with the need for teams of volunteers to help collect information about existing tutor/mentor programs so that the Program Locator database is updated on a continuous basis. This essay shows that role. This is a map that shows some of the places I try to connect and share ideas with others who have an interest in volunteer-based tutoring and/or mentoring programs. Here's the live map. Click on any of the links and you can join in places where I'm connecting. The problem is, I can't find many on-line places where volunteers, leaders, researchers, donors, etc. 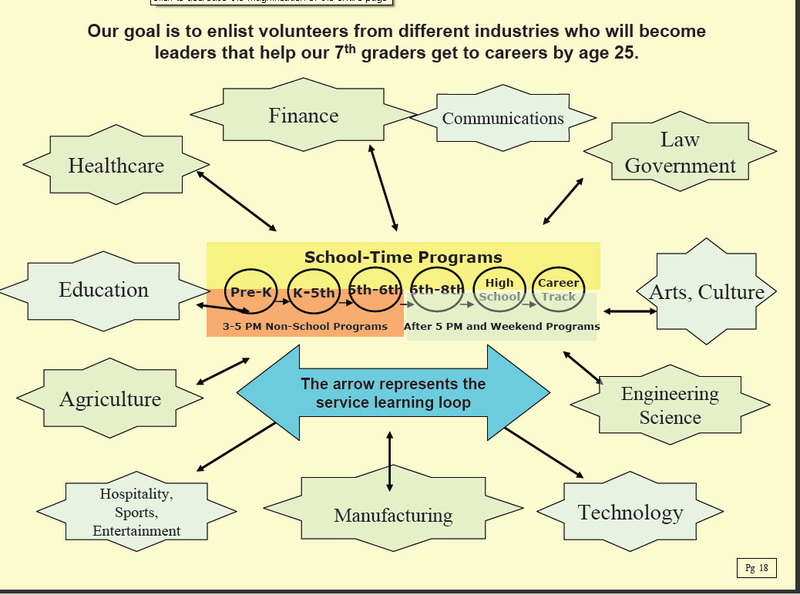 are talking to each other and using maps and visualizations like on this blog to share ideas of how mentoring programs can help more kids through school and into careers. I do web searches often to try to locate such groups. Today I did one and here's a couple of links I'll follow this week to try to make an introduction. Do you know of open, interactive forums where ideas like on this blog are being discussed? Add a comment and share the link.